Hawaii was a very nice setting for the movie. 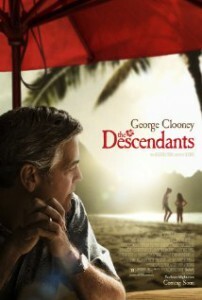 George Clooney did a good job in this movie , you will really feel for his character. Amara Miller, a first-time actress, was an absolute natural as the naughty but lovable 10-year-old Scottie . At times the movie seems to drag on with no direction. Matt King: I don’t want my daughters growing up entitled and spoiled. And I agree with my father – you give your children enough money to do something but not enough to do nothing. Sid: How often do adults just haul off and hit you like that? This movie is supposed to be a comedy/drama , but it is more of a serious drama . This is a good thing because it touches on real life themes which would be cheapened if too much humor was put in the movie. Clooneys role as the absentee father who grows into the task of parenthood because of unexpected events , was portrayed excellently . It is quite a sad movie , but it makes you realize the importance of family . I appreciate looking at your websites. Thanks for your time! Incredible….this is a important web page. Whoa this is a helpful online site. Magnificent website. Plenty of helpful info here. I’m sending it to some friends ans also sharing in delicious. And certainly, thank you in your effort!